I am lucky that my 2-year old isn’t a picky eater. Other parents watch on jealously as she wolfs down plates of lentils, mushrooms, peas and begs for olives. My kid’s good eating habits definitively have something to do with the fact that I didn’t give her any refined sugar or processed foods until she was almost two (making your own baby food really isn’t that difficult or time-consuming). So, her taste buds haven’t been tainted by chemically-enhanced flavors. Recipe: Pancakes with brown lentils, feta cheese, garlic, and zucchini. Mix the dry ingredients together. Then make a well in the center and add the egg and milk. Mix until smooth. You can add pretty much anything to this pancake base. Just cook/sauté the combo first and make sure that all the ingredients are chopped small enough that they won’t make noticeable big chunks in the pancakes. You’d never guess that these pancakes are loaded with nutritious lentils! I am lucky that my toddler has an obsessive love for olives. When she is being a picky eater, all I have to do is offer her an olive for each bite of food she eats. I know she is full when the bribe doesn’t work anymore. 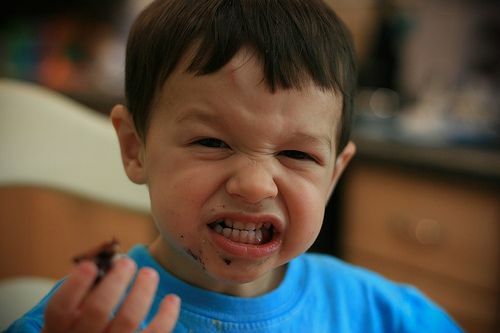 ***Note: Never bribe your kid with sweets. This will just make him/her want the main course less! Kids are much more likely to eat something if they helped make it – and young kids love to help! I give my daughter a blunt knife and have her chop up the soft ingredients (like mushrooms or tofu). I also show her how I heat the oil, add each ingredient, and so forth. She thinks it is amazing how flour turns into bread and how macaroni goes from inedible to soft and delicious. Now, I am not a super-mama, so I don’t have time or patience to cook with my kid every night. But, I’ve found that giving my toddler a small task actually keeps her busy so I can get the bulk of the cooking work done. This is my daughter rolling out dough for her calzone. I put lots of bran in the dough for extra iron. Young kids feel powerless in the world and try to gain some control through refusal (hence why “no” is a favorite word of toddlers). You can make your kid feel more in control by offering a choice of foods. For example, I’ll ask my daughter if she wants peas or broccoli with dinner. Given a choice, she is much more likely to eat the chosen food. 5) Lay Off the Snacks! There may be a very good reason why your kids aren’t eating their food: They may already be too full from snacks. As Karen Le Billon, author of French Kids Eat Everything, points out in a NY Times article, American children are 3x more likely to be overweight than French children. French children also aren’t picky eaters like us Americans and have no problem with foods ranging from cauliflower to beets. The difference in eating habits can be attributed to the fact that French kids only snack once per day. By contrast, American kids are constantly chowing down on something. I give my daughter a healthy snack when she gets home from preschool at 4 (I usually let her make her own snack). After that, she doesn’t get anything other than water until dinner at 7. By then, she is hungry and always clears her plate!